・ Fischer, Andreas. "'Sumer is icumen in': The Seasons of the Year in Middle English and Early Modern English". Studies in Early Modern English. Ed. Dieter Kastovsky. Mouton de Gruyter, 1994. 79--95. ・ Peters, Hans. 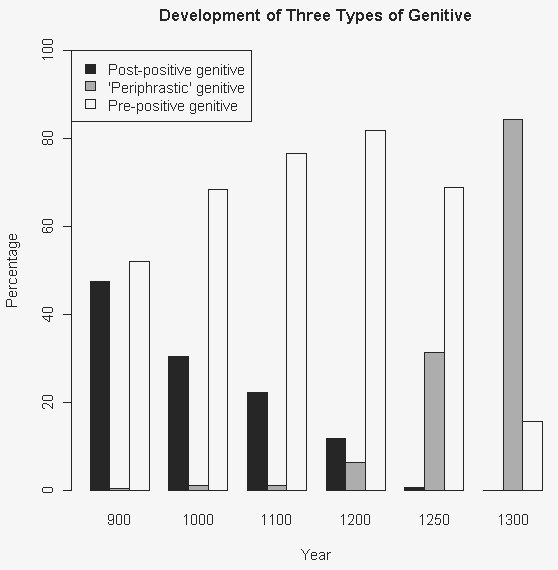 "Degree Adverbs in Early Modern English." Studies in Early Modern English. Ed. Dieter Kastovsky. Mouton de Gruyter, 1994. 269--88. After some two centuries of this dilution of Norman blood, it would indeed be strange if English (the language of the mother being the dominant factor in a child's early linguistic training) had not by this time established itself as the true vernacular of this country. In all probability the peasants in country districts had never used anything else. 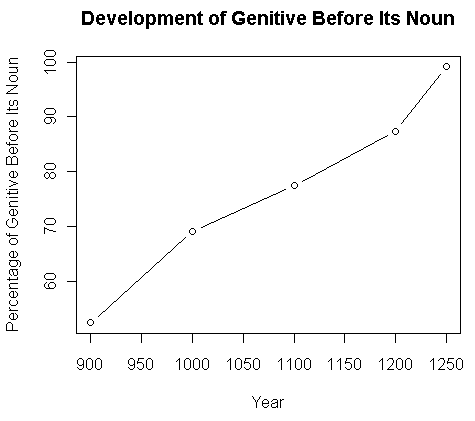 The claim that French remained in current vernacular use in England for centuries after the Conquest is based largely on the emphasis placed by historians --- literary, political, and legal --- on the great number of extant works in Anglo-Norman. Mere numbers of themselves, however, prove very little. Moreover, the fact that written documents of this nature survive in French does not guarantee that the majority of people used this language in speech and everyday life. The teaching manuals examined here would seem to indicate that French in later thirteenth-century England was on the contrary an acquired language. ・ Rothwell, William. 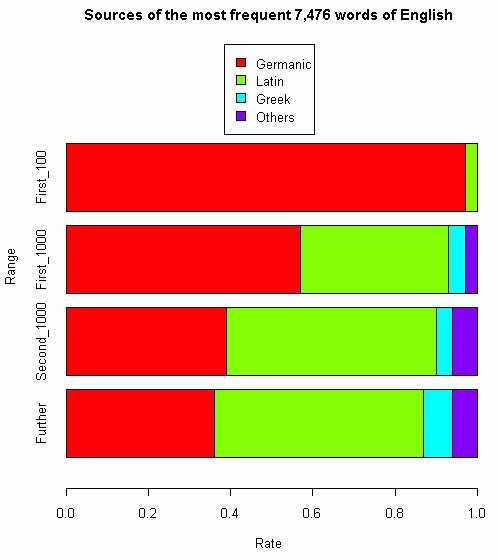 "The Teaching of French in Medieval England." Modern Language Review 63 (1968): 37--46. But with all its manifold new words from other tongues, English could never have become anything but English. And as such it has sent out to the world, among many other things, some of the best books the world has ever known. It is not unlikely, in the light of writings by Englishmen in earlier times, that this would have been so even if we had never taken any words from outside the word hoard that has come down to us from those times. It is true that what we have borrowed has brought greater wealth to our word stock, but the true Englishness of our mother tongue has in no way been lessened by such loans, as those who speak and write it lovingly will always keep in mind. In Early Modern English, many prepositions still had a far wider range of meanings than they do today. Now they are quite restricted in use, with consequent difficulties for learners. One reason for the changes is that many new prepositions and sprecialized prepositional phrases came into use in later Middle English and Early Modern English, meaning that the scope for each word became smaller. For example. several earlier functions of by were taken over by near, in accordance with, about, concerning, by reason of, and owing to; for came to be replaced often by because of or as regards; and prepositional but became almost wholly replaced by unless, except, or bar (though it survives in the phrase all but you). ・ Gelderen, Elly van. A History of the English Language. Amsterdam, John Benjamins, 2006. ・ Schmetterer, Victor. "The History of the English Language and Future English Teachers." Studies in Early Modern English. Ed. Dieter Kastovsky. Mouton de Gruyter, 1994. 371--77. Secondary modifiers or intensifiers differed considerably. The old forms, full, right, were still in general use; newer very was known, but not used by everybody even in the 17c. For a more forceful degree of modification, wonderous and mighty were inherited, but such terms wear out quickly, and changes have been considerable. During II [1770--1570], pretty, extraordinary, pure, terrible, dreadful, cruel, plaguy, devillish, take on this role, and most of them have lost it again since. We must distinguish here the built-in obsolescence affecting such items at any time, from the particular factors operating between II and I [1970--1770]. These arose from a sense of correctness which prescribed that forms with the appearance of adjectives should not be used in secondary modification. Very was all right because it did not have this form; but instead of extraordinary, terrible, dreadful, etc., the corresponding -ly forms came to be required.